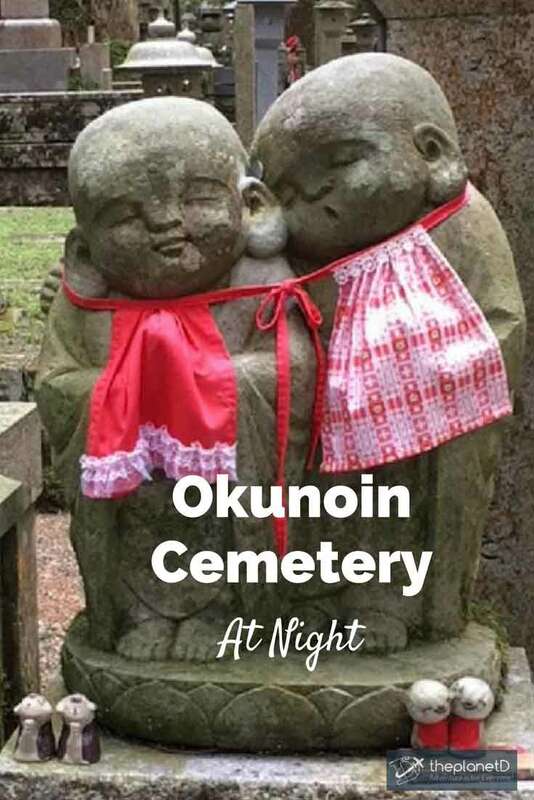 Guest writer Talek Nantes shares her experience visiting Okunoin Cemetery at night on Koya-san in Japan. The lights from the stone lanterns begin to flicker on at dusk emitting a ghostly yellow light that casts shadows among the moss-covered tombstones. Eerie sounds from screeching flying squirrels and night owls add to the otherworldly atmosphere. The Buddhist monk gathers his little tour group and leads us deep into Okunoin Cemetery. 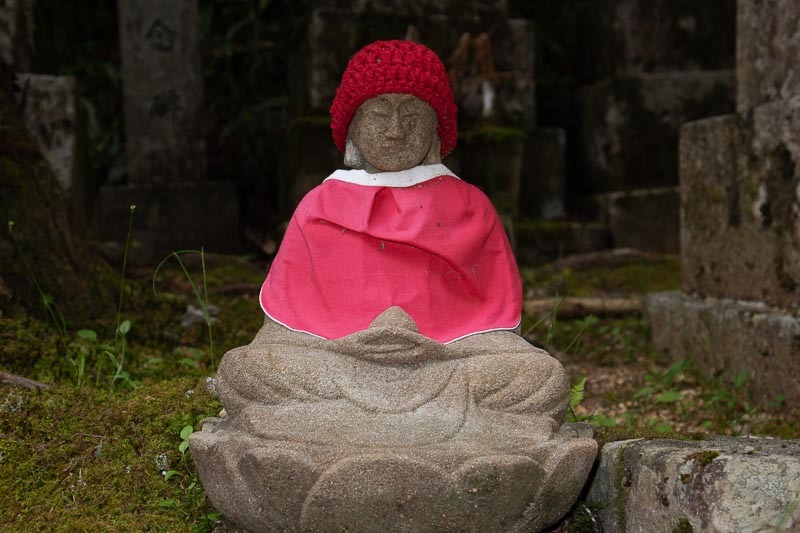 The most notable features along the stone paths are little statues with red woven hats and aprons. These are the Jizo Bosatsu, stone figurines that represent spiritual beings who strive for the enlightenment of all creatures, not just themselves. They may appear quaint and cute, but they tell a sad story. 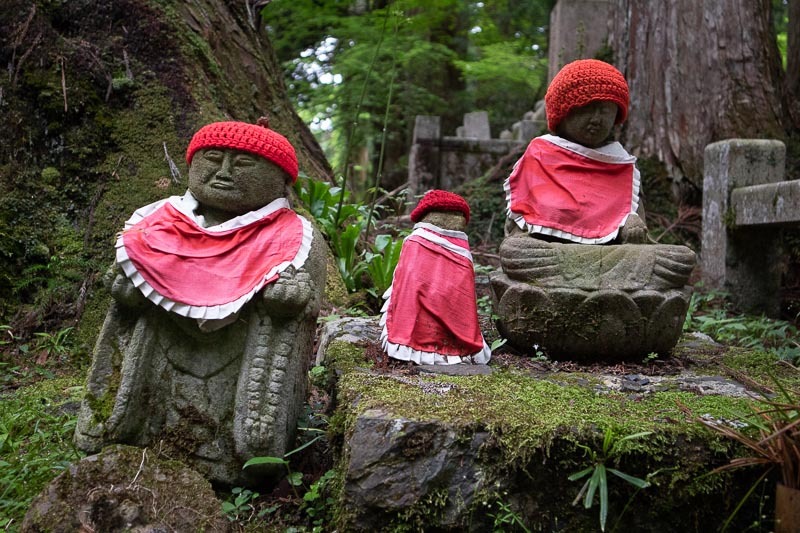 These small, child-like statues represent the Jizo Bosatsu that protect the souls of children. 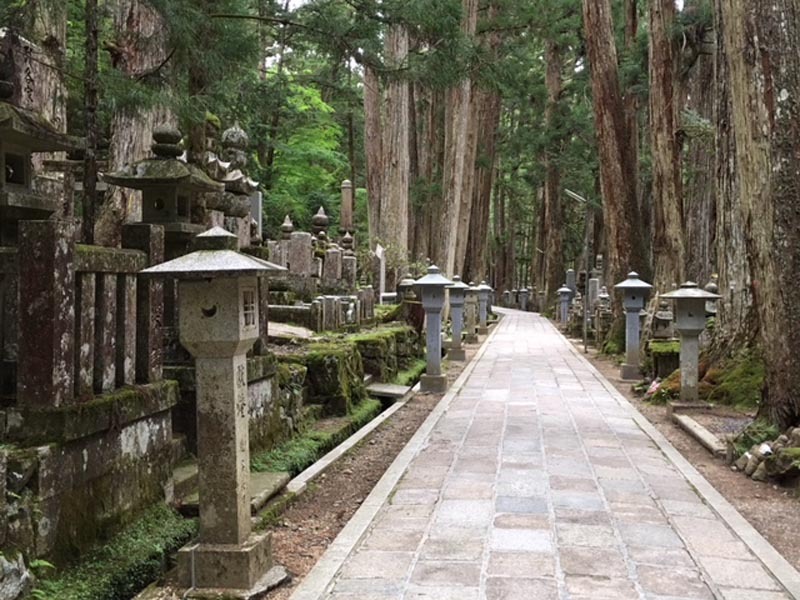 The Okunoin Cemetery in Koya-san is Japan’s largest cemetery. It is the final resting place of hundreds of thousands of souls. No one knows the exact quantity because the cemetery is over 1200 years old. The place is interesting enough during the day. But at night this vast necropolis becomes ghostly yet somehow beautiful. And that is the best time to visit. The local monks sponsor night tours where they talk about the history of the cemetery itself, the daily lives of the monks and the aspects of the Shingon Buddhism religion they practice. Koya-san, or Mount Koya was founded in early 800 CE and grew to encompass over 120 temples. It is regarded as sacred by adherents of Shingon Buddhism because it houses the mausoleum of the religion’s founder, Kobo Daishi. The mausoleum lies in the center of the cemetery surrounded by tall cedars and thousands of stupas or gravestones. The interior of the mausoleum is ablaze with thousands of lanterns which, legend has it, have been burning since the spiritual leader began meditating here over 1,000 years ago. Kobo Daishi is believed to still be in a state of deep meditation even today, and food is lovingly and ritually prepared for him daily. It is important for believers to be close to their religious leader. 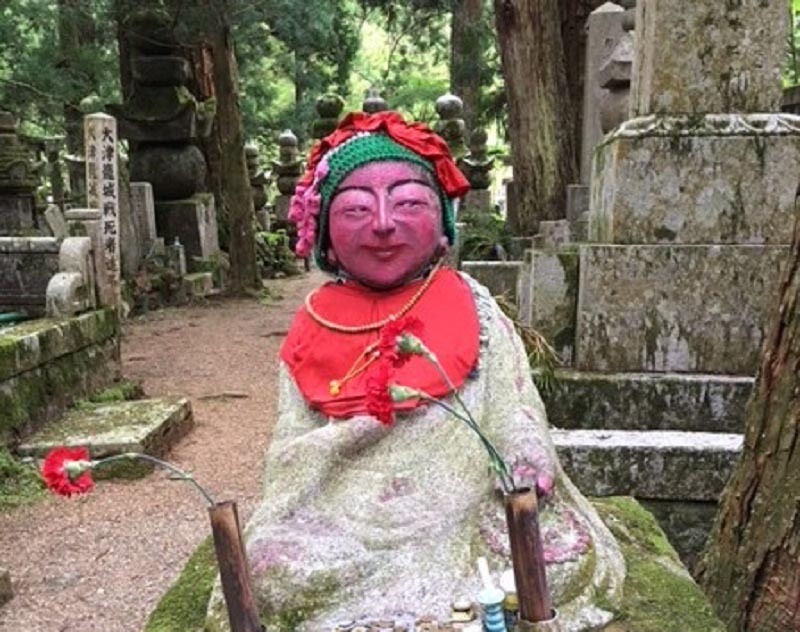 Adherents don’t necessarily have to be buried in Okunoin, a physical representation, even a lock of hair, is sufficient to have a meaningful connection to Kobo Daishi and be among the first to welcome the future Buddha upon his return to earth. The complex is so meaningful to its adherents that it was named a UNESCO World Heritage Site in 2004. It’s not just size and religious significance that makes Okunoin such a fascinating place. 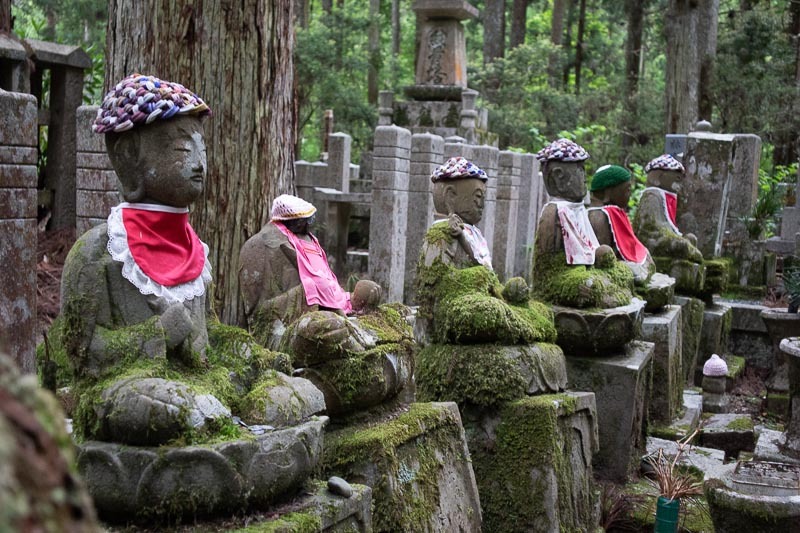 The headstones are what stand out, particularly the Jizo Bosatsu. In keeping with the tenants of Shingdon Buddhism which values all creatures, there are monuments to insects erected by the pesticide company that exterminated them. There is a monument dedicated to the enemies of Japan that were killed in wars throughout the ages. Japanese companies maintain monuments for their employees as a corporate benefit. 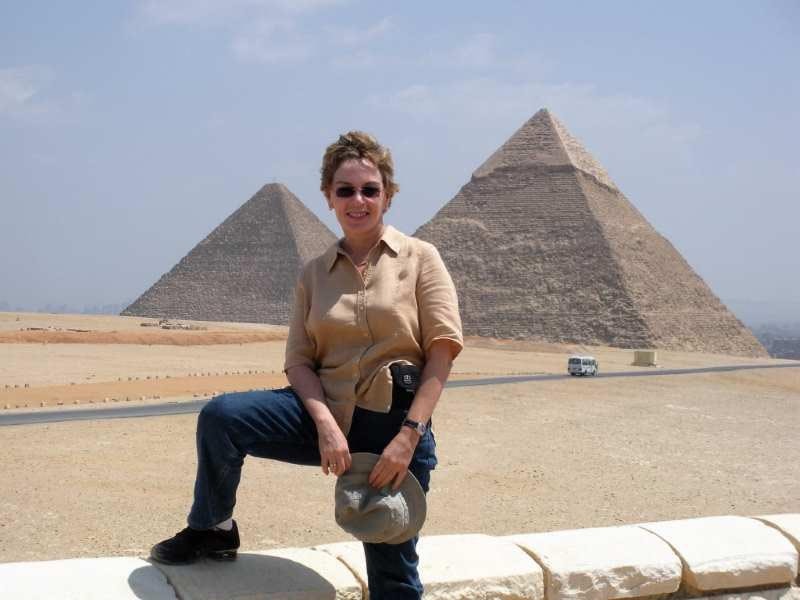 There are monuments representing spaceships, eating utensils and pyramids. But the most poignant and touching of them all are the Jizo Bosatu. 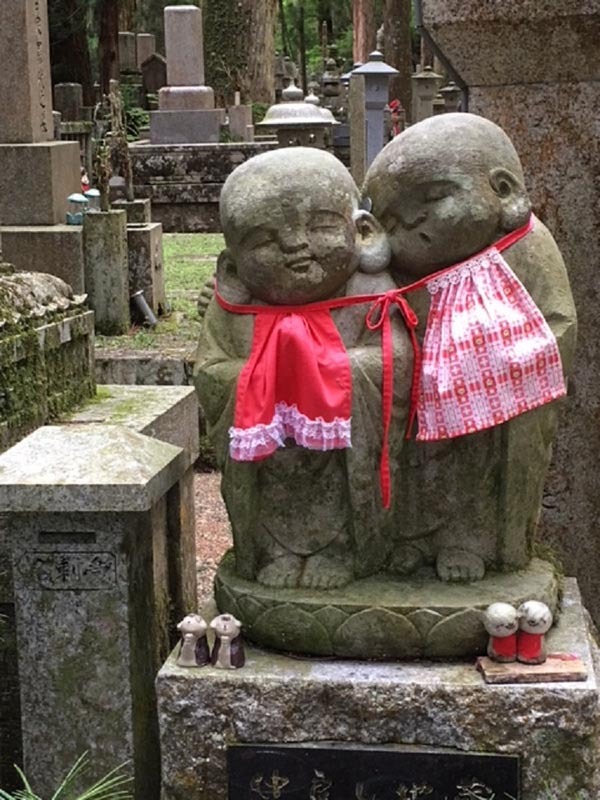 It tugs at the heart to imagine parents coming to Okunoin and presenting offerings to these little spirits in return for peaceful passage of their children to the afterlife. Most of the offerings consist of small coins, candles, coffee cans, incense and sometimes food. To ensure the spirits are warm in the chilly nights, most are given simple woolen hats and bibs or aprons, but others can sport elaborate capes, make-up and lipstick. The sight of hundreds of these stone figurines clad in children’s clothing in a cemetery setting at dusk is downright gripping. Admission to Okunoin is free. Night tours can be booked at tourist kiosks around town or online. The tours begin at the entrance to the cemetery and end at the mausoleum of Kobo Daishi. You are on your own walking back to the cemetery entrance at night but there is enough light from the stone lanterns to help you find your way. Getting to Koya-san does require some time. After all, it is on a remote mountaintop. But, this being Japan, instructions are pretty straightforward, and you won’t get lost. You can reach Koya-san via the Nankai Electric Railway from Namba Station in Osaka. This will take you to Gokurakubashi at the base of the mountain. The limited express to Koya takes 80 minutes and costs ¥1610. The regular express is cheaper at ¥1210 and only takes an additional 10 minutes. In Gokurakubashi you must take the cable car up the mountain for about another 10 minutes. It is a beautifully scenic ride up to Koya-san on the cable car so make sure to get a window seat. The cable car will deposit you at the cable car station where you can catch the bus to Okunoin. The Okunoin bus stop is the final stop of the main bus line that connects Okunoin with the town center (Senjuinbashi) and the cable car station. The bus ride takes 20 minutes and costs 410 yen from the cable car station. There are 2-3 buses per hour. The bus stop is at the entrance of the cemetery. From there, it is about a one-kilometer walk to the mausoleum straight through a recently renovated part of the graveyard. A visit to Okunoin is a unique experience that will stay with you for a long time. Talek Nantes is an author, digital content creator and founder of the travel blog, www.travelswithtalek.com. 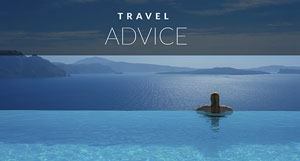 She is a passionate travel enthusiast and enjoys sharing her travel experiences with others. 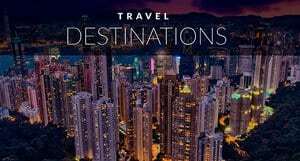 Talek's personal and professional background have led her to travel to over 110 countries and her work has appeared in several travel publications. Talek lives in New York City with her husband. 15 Responses to "Meet the Little Spirits of Japan’s Okunoin Cemetery At Night"
So beautiful and awesome pictures. I never saw anything like that It’s so beautiful. Keep sharing. I love it. Looks like I’ll have to cancel my next year’s trip to USA and land here in Japan! Such offbeat little things make for the best of trips! 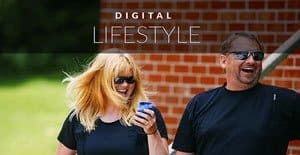 Amazing post and pictures! But seeing the statues and the point that you visited at night, Were you not afraid that maybe these statues are following your movements with their beady red eyes! Getting a little spooked! 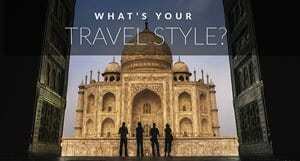 one of the dream place i would go once, the images you taken that proved you enjoyed your trip a lot. Wow! looks really interesting and beautiful. Thanks for sharing. The warm Tsushima Current flows from the south into the Sea of Japan, where it meets a colder current from the north. The mixing of waters makes the seas around Japan very rich in fish and other sea life. . Interpult Studio – ?????? ??????????? ??????????? This is beautiful…I has so clue that something so amazing exists in Japan. Loved it. Thanks for sharing. This is very interesting! Would love to go on that night tour! Wow, how interesting! I have never seen anything like this before. Fantastic!! Such a incredible post about the Okunoin Cemetery at night. These pictures looks amazing. I would love to visit this place.. Keep sharing!